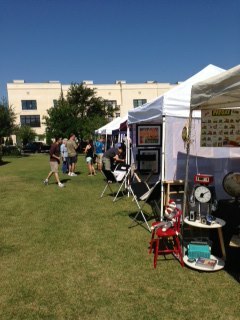 Shop handmade art and goods 10 a.m. – 6 p.m. Saturday, June 15 at Magnolia Green in Fort Worth. You’ll find dozens of vendors with handmade jewelry, art, collectables and more. Find that kitsch item for your home, or that one of-a-kind gift you’ve been searching for. Admission and parking are free. Our mid-sized shopping events are big enough to have a wide selection of items, and small enough for you to walk through with ease. Get fed by a local food truck, and bring a blanket to spread out on the lawn.